I’m working on a new project, and one piece includes a discussion of how much campaigns spend on media and advertising. This is no easy task, since campaign finance reports are itemized in very different ways. My co-authors and I downloaded FEC data from federal candidates and categorized itemized expenditures into various categories. We then used the data to estimate the percentage of Senate candidates’ total expenditures that went to TV, online, and other media (excluding print). 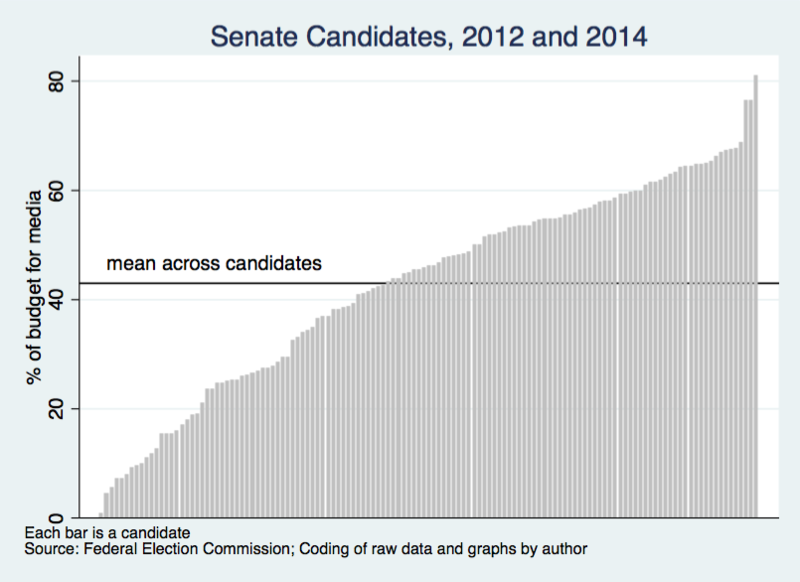 The graph for candidates in 2012 and 2014 is below. The mean is about 43 percent of all costs, though there is considerable diversity across campaigns. These results do not weight campaigns by the significant range of total expenditures as a result of varying state sizes and campaign viability. 43 percent is a pretty big chunk, however. More than $2 of every $5 that a typical campaign spends goes to ads. Think about that.